What is Climate Ready North Bay? 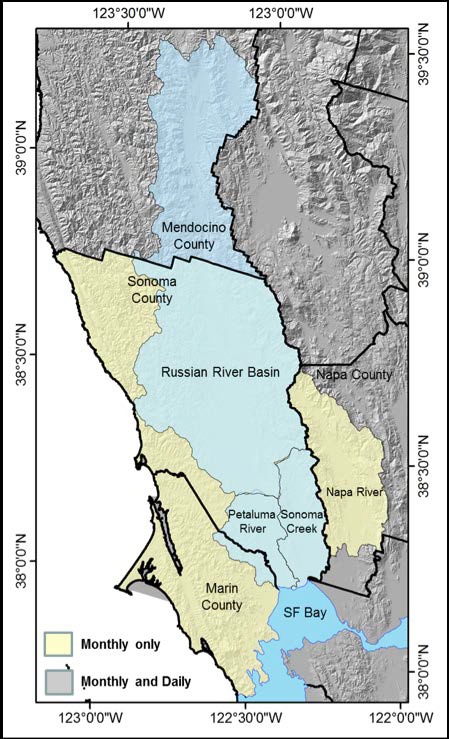 To create a framework for adapting to climate change, decision-makers working in Northern California’s watersheds need to define climate vulnerabilities in the context of site-specific opportunities and constraints relative to water supply, land use suitability, wildfire risks, ecosystem services, biodiversity, and quality of life (e.g. Mastreanda 2010, Ackerly et al. 2012). Working in partnership with the Sonoma County Regional Climate Protection Authority (RCPA) and the North Bay Climate Adaptation Initiative (NBCAI), Pepperwood’s Terrestrial Biodiversity Climate Change Collaborative (see Chornesky et al. 2013, available here) has developed customized climate vulnerability assessments with select natural resource agencies of California’s Sonoma, Marin, Napa and Mendocino counties via Climate Ready North Bay, a public-private partnership funded by the California Coastal Conservancy’s Climate Ready program. The goal of Climate Ready North Bay is to engage natural resource agencies, including water agencies, parks, open space districts, and other municipal users to collaboratively design climate vulnerability information products specific to their jurisdictions, mandates, and management priorities. With agency input guiding the development of the vulnerability assessments, spatially-explicit data products are now available to help local governments and agency staff implement informed and effective climate adaptation strategies. These products include customized maps, graphs, and summary technical reports tailored to site-specific resource management challenges, located within the watersheds in this map below. For more information, please visit the Climate Ready North Bay Exchange Pages. Climate Ready North Bay produced reports detailing projected impacts of climate on vegetation for select Conservation Lands Network “Landscape Units”—regions demarcated by major physiographic features, primarily mountain ranges and intervening valleys. Click below to view Climate Ready Vegetation Reports for each Landscape Unit. This Climate Ready Management Implications document serves as a guide for how resource managers can interpret each of these Climate Ready Vegetation Reports. Learn more about the science behind modeling climate impacts on vegetation.